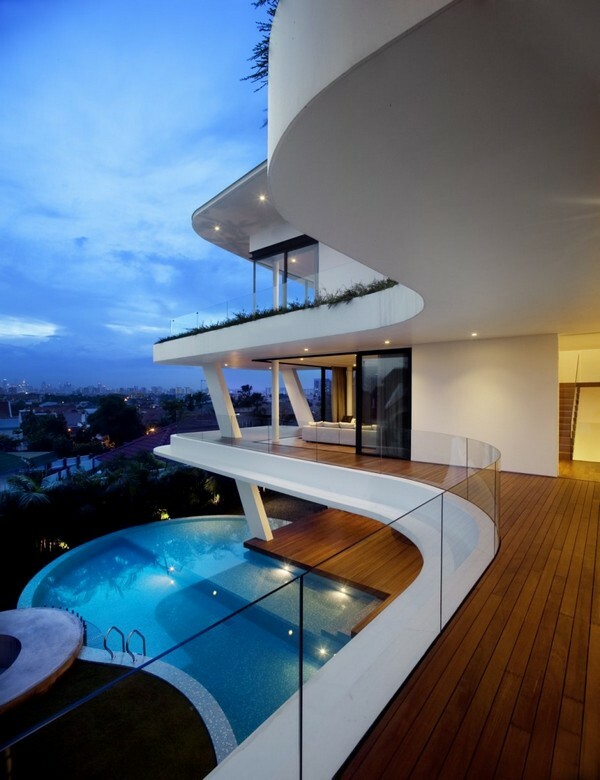 Singapore based firm Aamer Architects created a lustful new abode on their local Siglap Hill called The Ninety7 House. From room placement, to colors, to philosophical concepts, The house was meticulously thought through. The exterior architecture of the home is designed to resemble curvilinear folds which start on the second floor and fold up over the third, functioning as the roof, creating a "shelter" like feeling for the home and it's owners. White was chosen as the dominant color of the home to allow the natural trees, shrubbery, and water below to be visually featured. Aamer created wide architectural openings throughout the home to keep natural ventilation circulating. And with all seriousness aside, The Ninety7 would be an awesome space for a poolside soiree!